In July 2016, the rehearsal script for Harry Potter And The Cursed Child was released in book format. Playing at London's West End, this show was written by scriptwriters John Tiffany and Jack Thorne and was based on an original story from Harry Potter creator J.K. Rowling. With no current plans for the show to be produced internationally, and with so many Harry Potter fans out there showing an interest, the book was an instant success, despite the format it was printed in. 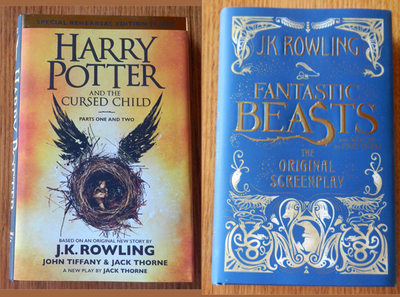 In a similar fashion, J.K. Rowling's Fantastic Beasts And Where To Find Them was released as a screenplay script in November 2016. With the original story now out of print, and a reprint due in March 2017, the script format is the only way that people interested in the story are able to currently get a copy (unless they buy the novel second-hand). Do you enjoy reading books in script format or do you prefer to read stories in a normal novel style? Would you buy a book in script format simply to have it or would you rather wait for an actual novel to be released? Would you rather read the script or watch the film/ play? If you buy a script, do you act it out or just read it as normal? I love scripts, but I'm really active in theatre. It's definitely not the same experience as reading a novel. Part of the fun of reading a script for me is imagining how I would stage it. Reading "Harry Potter and The Cursed Child" was frustrating for me because it would be so difficult for amateurs to stage (if amateurs are ever even granted performance rights, which may not happen). It was obviously written knowing there would be an ENORMOUS production budget available, but finding creative ways to make magic on the cheap can be fun. The thing that's less surmountable is the fact that it's two full two-hour plays. It's hard enough to get butts in the seat for one production, much less two. That part just seemed self-indulgent on the part of the authors to me. I love Harry Potter, but it's no "Angels In America." Edit, for heaven's sake! The upside, though, was being able to at least experience the play in part, since I'm sure seeing a production will be out of the question for me for quite some time.